Tanjung Piai is a cape in Johor which is the southernmost point of Peninsular Malaysia and thus the most southern point of mainland Eurasia. The skyline of Singapore is visible across the Johor Strait from the point. It features seafood restaurants, perched on wooden jetties that are surrounded by a rugged and rarefied coastline of unspoiled mangrove forests. 0.33 nautical miles south of the point, at the edge of the dries, is a 15 metre light tower which flashes once every 3 seconds and houses a radar transponder beacon which transmits the Morse letter "M". 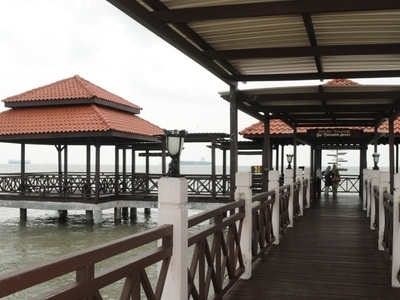 Here's the our members favorite photos of "Coastal Areas in Johor". Upload your photo of Tanjung Piai!